Harry McCollum, co-founder and co-owner of Harry’s of Arlington passed away Saturday morning. 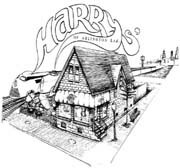 When Harry McCollum and his sons, Greg and Harry opened Harry’s in 1993 it was exactly 100 years after the building at the corner of Campbell Street and Vail Avenue had been built. The building has survived the building that housed the Vail Lounge to the south and a building that housed a Chinese restaurant and the Corner Store to the west. The building now the home of Harry’s of Arlington at 1 N. Vail Avenue opened in 1893 as Redecker General Store. It’s been a grocery store, a furniture store, a pool hall and a campaign center for the Richard Nixon local campaign, and then the Billy Club restaurant. Since the McCollum’s founded Harry’s of Arlington, they’ve added live music on weekends, Thursday night trivia contests, Friday fish fry events and an Arlington Heights Idol contest. They’ve also developed the outdoor patio into a popular beer garden and tiki bar. Harry McCollum served in the National Guard for eight years. Harry’s wife, Patricia McCollum, passed away in 2010. Harry McCollum is survived by his children, Kathy (Steve) Butler of Wauconda, Barb Holden (Dwain) of Harvard, and Patty (Steve) Barker, Greg (Sharon) McCollum and Harry (Ann) McCollum, all of Arlington Heights, as well as 13 grandchildren. Visitation for Harry McCollum will take place from 3 to 9 p.m. Tuesday, August 23, 2011 at Glueckert Funeral Home, 1520 N. Arlington Heights Road, in Arlington Heights. A funeral Mass takes place at 10 a.m. Wednesday at St. James Church, 831 N. Arlington Heights Road, in Arlington Heights.